In July, Drs. 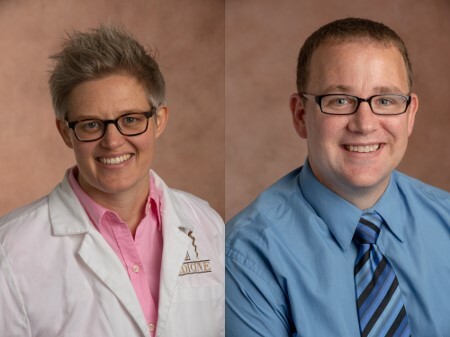 Kristi VanDerKolk and Wesley Eichorn will take on new leadership roles in the medical school’s Department of Family and Community Medicine. Dr. VanDerKolk has been named the new Family Medicine Residency Program director in Kalamazoo and will begin her role on July 1, 2019. When Dr. VanDerKolk begins her new duties, Dr. Eichorn will replace her as the Family Medicine clerkship director. The transition comes as Dr. Glenn Dregansky has announced his retirement as program director of the Family Medicine Residency Program in Kalamazoo, effective June 30, 2019. Dr. Dregansky has served in the role since 2016. “I want to thank Dr. Dregansky for his service and leadership,” said Dr. Lisa Graves, interim chair of WMed’s Department of Family and Community Medicine. Dr. VanDerKolk has served as an assistant professor in the Department of Family and Community Medicine since 2013 and became the department’s founding clerkship director in 2015. Prior to coming to WMed, Dr. VanDerKolk earned her MD degree from Wayne State University School of Medicine and completed her residency training at the University of Michigan. Dr. VanDerKolk has held several leadership positions at the medical school, including her service as vice-chair of the Medical Student Performance Committee (MSPC). Currently, she is the interim chair of the MSPC and a member of the Medical Student Curriculum Committee. Dr. VanDerKolk is a member of several professional societies, including the American Association of Family Physicians, the American Medical Association and the Society for Teachers of Family Medicine. Additionally, Dr. VanDerKolk is a member of the Michigan Academy of Family Physicians’ Advocacy Committee and formerly served as a Michigan delegate to the National Conference of Constituency Leaders (NCCL), as well as a national delegate of the American Academy of Family Physicians’ Congress of Delegates. Dr. Eichorn, who completed his residency at WMed in 2017, joined the Department of Family and Community Medicine as an assistant professor in October. Prior to joining the faculty at WMed, he worked for more than a year as a physician at Bronson LakeView Family Care in Mattawan, Michigan. Dr. Eichorn is a graduate of the Michigan State University College of Osteopathic Medicine and a diplomate of the American Board of Family Medicine and the American Board of Obesity Medicine. He also is a member of the American Academy of Family Physicians and Michigan Academy of Family Physicians, as well as the Obesity Medical Association, the American College of Osteopathic Family Physicians and the Christian Medical and Dental Association. Dr. Eichorn was recently appointed as Michigan’s new physician delegate to the 2019 NCCL, which is the American Academy of Family Physicians’ leadership and policy development arm focused on empowering change makers to catalyze positive change in family medicine. Dr. Graves said she is pleased that Dr. VanDerKolk and Dr. Eichorn will be stepping into their new leadership roles later this year. She said they will continue to be valuable assets for faculty, residents, and students at the medical school. A Heartfelt Thank You from the FHC Family! This health center receives HHS funding and has Federal Public Health Service (PHS) deemed status with respect to certain health or health-related claims, including medical malpractice claims, for itself and its covered individuals.